Trading is the process of buying the security of a company. The investor takes a decision of investing in a particular company based on its past performance and future potential. The Indian share market has a complex mechanism that ensures investors receive the shares they bought or the money they made by selling the same. 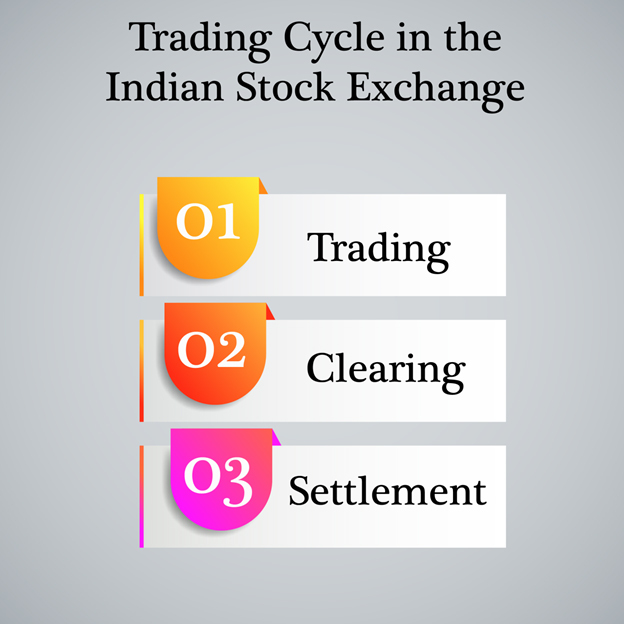 The process by which the shares are settled in the Indian stock market is called the trading cycle. Trading is the process of buying the security of a company. The investor takes a decision of investing in a particular company based on its past performance and future potential. Trading is said to have happened when the investor has confirmed the order and the money has been debited from his/her account towards the shares of the company. Clearing is the process by which an organization acts as a link between a buyer and a seller to ensure a smooth transaction of money and the shares. Clearing is necessary for matching the sell and buy orders from each other. Investors, to avoid complications, transfer the money to the clearing corporation rather than crediting the account of the company itself. This enables a smooth transaction and reduces the chances of fraud on account of both the parties. When the demat of the investor is credited with the shares he/she bought, or his/her bank account is credited with the money they earned on selling the shares, the settlement is said to have occurred. Clearinghouses, after clearing all necessary obligations of funds transfer, give the go-ahead for the settlement of the shares or the money to the investor’s account. The two depositories of the Indian share market - National Securities Depositories Limited (NSDL) and Central Depositories Services Limited (CDSL) - are responsible for the transfer of shares which is done in dematerialized form. The required securities are made available through the pool account of members/custodians with the depository participants (brokers, banks, investment firms, etc.) according to the prescribed pay-in time of the securities. The depository then transfers the shares from the pool account of custodians/members to the account of the other party according to the prescribed pay-out day. The investor is informed electronically about his/her obligations regarding the fund transfer on the pay-in day. He/she ensures that the required funds are available in his/her account so that they can be transferred to the concerned company. The funds' obligation file is then forwarded to the clearing bank by the clearing agency which debits the account of the investor and credits the account of the clearing agency. The clearing agency, after clearing the obligations, moves to the next step of settlement and credits the funds from its account to the account of the company and credits the shares into the account of the investor. The trading cycle is the most crucial processes that enable an effortless transaction between the investor and the company. The process has evolved over time, and 99% of the total turnover is settled in electronic form, making it quick and easy.